Acknowledging the scientific contributions of one of the United States best known founding fathers, the US Mint released the 2006-P Benjamin Franklin Scientist Proof Silver Dollar. Initially available for sale on the 300th anniversary of Franklin’s birth, the Scientist Coin highlights the fact that Franklin spent much of his life in the pursuit of knowledge – long before he became the statesman we remember him for today. Among his many scientific contributions were the study of electricity and the invention of the bifocals, flexible catheters, swimfins and the lightning rod. The Franklin coins are struck from 90% silver to a diameter of 1.5 inches. The US Mint placed a surcharge on the sale of each of the Franklin coins. Funds raised were forwarded to the Franklin Institute for purposes of the Benjamin Franklin Tercentenary Commission. Struck from 90% silver, each Franklin Silver Dollar has a diameter of 1.5 inches. 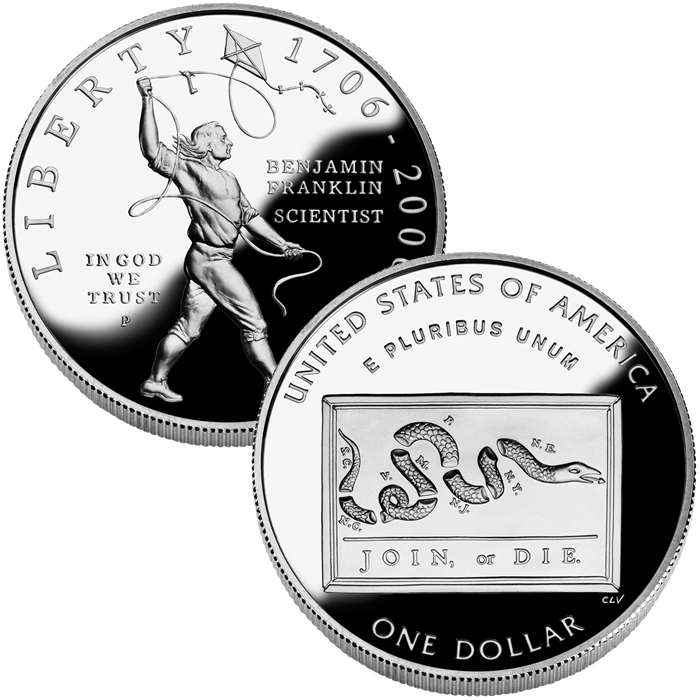 The US Mint released the Proof Franklin Scientist Coin on the 300th anniversary of his birth – January 17, 2006. 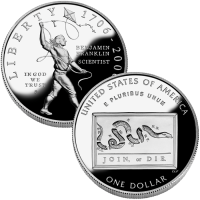 The initial price charged for the Franklin Scientist Proof Coin was $35.00. Each Franklin Silver Dollar was struck at the US Mint’s facility in Philadelphia and show the ‘P’ mintmark. The obverse (heads side) of the Scientist Coin shows a young Franklin doing his famous kite experiment. It is the work of Norman E. Nemeth. The reverse (tails side) was completed by Charles L. Vickers and shows Franklin’s "Join, or Die" cartoon published in 1754.